This sampler kit includes two probes: 5-FAM-ZOL and AF647-ZOL. 5-FAM-ZOL has in vivo antiresorptive activity and can inhibit protein prenylation of macrophages; and AF647-ZOL has been shown inactive in these studies. This kit is ideal for studies that require imaging probes with and without pharmacological activity. This sampler kit includes two probes: 5-FAM-ZOL and AF647-ZOL. 5-FAM-ZOL has in vivo antiresorptive activity and can inhibit protein prenylation of macrophages. AF647-ZOL has been shown inactive in these studies. This kit is ideal for studies that require imaging probes with and without pharmacological activity. 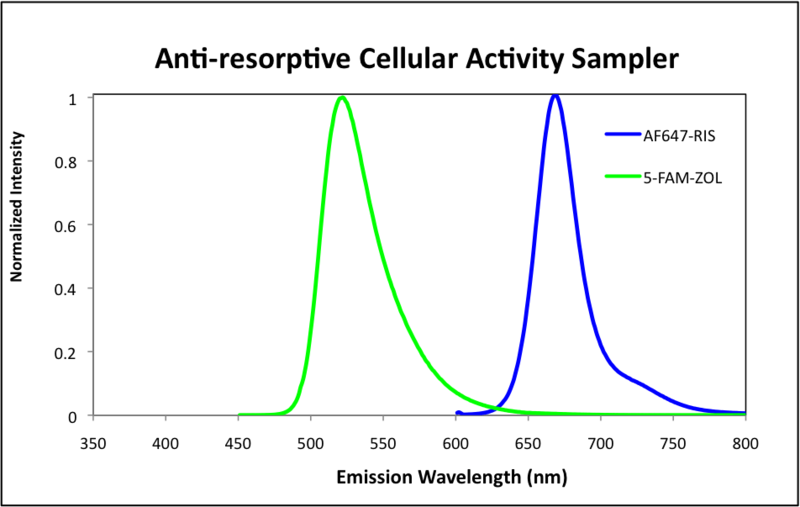 Emission spectra of 5-FAM-ZOL (in 0.1 M phosphate buffer, pH 7.2) and AF647-ZOL (in 0.1 M phosphate buffer, pH 7.0) .